When a cancer is discovered, once a specific name is given to it, we will discuss with you whether it can be cured or whether the realistic aim of treatment is control or "palliation". In either instance there are four possible treatments, surgery, radiation therapy, chemotherapy and immunotherapy. Single or combination treatments are frequently used. While these are the medical treatments we should not forget the uniquely veterinary treatments, good pain control or euthanasia. This is an emotion-laden topic filled with ethical dilemmas. Ultimately together, we must decide what is best for your pet. Sometimes this is difficult to separate from what is best for you. Overwhelmingly, the most effective treatment for any type of tumour is surgery. 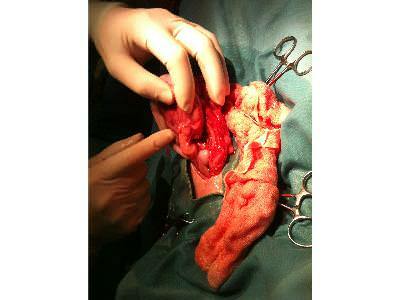 Whenever possible we want to remove the tumour together with a band of healthy, normal tissue surrounding it. This is the most effective way to control any cancer. If there is a likelihood of spread, for example with mammary tumours, we may want to remove the tumour, its surrounding tissue and the local lymph nodes that serve that part of the body. Minor forms of surgery such as burning with electrocautery or freezing with cryosurgery may be used when a tumour is known to be benign. Radiation therapy (at Cambridge University’s veterinary school) may be used on local radiation-sensitive tumours when it has been impossible to completely remove a mass or when the mass is inoperable. It is useful for tumours such as soft tissue sarcomas, squamous carcinomas, mouth and nasal cavity tumours and mast cell tumours. Anticancer drugs kill fast-multiplying cells. Almost all are dangerous and may produce unpleasant side effects. The only cancers that respond well to chemotherapy are certain lymphomas and leukemias, especially in small individuals. For all other cancers chemotherapy may improve the quality of life but is unlikely to prolong longevity. Grant Petrie is responsible for chemotherapy. The corticosteroid prednisolone has been used for decades to enhance the quality of life and prolong survival time in dogs and cats with certain forms of cancer, including lymphoma. More recently research has concentrated on ways of stimulating the immune system to attack a cancer. Although immunotherapy is still not widely available, results are promising, especially for aggressive lymphosarcomas and mast cell tumours. Melanomas in the mouth are treated quite successfully with a combination of surgery, radiation and immunotherapy. A significant difference between therapies in dogs and cats and therapies in people is one of ethics. Generally speaking most of us feel it is not acceptable for a pet to suffer from its therapy. The consequence is that both chemotherapy and radiation therapy are used less aggressively with pets than with people. The objective is minimal or no side effects. When this cannot be attained, we always consider a pet's emotional and physical well being. Sometimes the best treatment is not to attempt to cure the cancer but rather to regain a good quality of life for your dog, even if this means a shorter life expectancy. This is what palliative therapy is. There is evidence that some cancer cells, particularly lymphomas and lymphosarcomas, thrive on carbohydrates. Some nutritionists recommend avoiding carbohydrate-rich diets and to feed high fat diets instead. A high fat diet is both tasty and energy-dense. Fed long term it may 'starve' certain types of cancer cells that are unable to use fats for energy. Dogs and cats with cancers need more micronutrients. Ensure a good supply of vitamins and minerals. Antioxidants such as vitamins A, C and E and the mineral selenium are more problematic. No doubt antioxidants help keep cells healthy but their nourishing value may also help keep cancer cells healthy too. Before using any nutritional supplements, discuss your plans with our clinical nutritionist, Ashley McManus. There is now fascinating evidence that for people with cancer, a positive feeling or a feeling of well-being prolongs survival time. In one study churchgoers survived longer than non-churchgoers of the same age, social and economic status and with the same forms of cancer. Some may attribute this to divine intervention. Others will say that prolonged survival is a result of belief or contentment. In any social species and that includes all dogs and those cats that think of you as ‘mother’, touch has a powerful effect. If your dog has any form of cancer and enjoys physical contact with you and your family, indulge him or her. In some as yet undefined way you may be helping the body fight the cancer.